The garden pond pump articles provides guidance and review about different types, qualities, durabilities, and prices. This pump is used to circulate the water in a small pond created in our garden in our backyard. A garden pond is the small water reservoir usually built in the gardens for the decorative and aesthetic purposes. These ponds are also an excellent wildlife habitat. With more urbanization and deforestation, we are losing our natural habitat and ecosystem. A garden pond may serve a small ecosystem and helps in preserving our nature. Garden ponds serve as the home for a lot of the wildlife and aquatic organisms. Garden pond pumps also help in keeping our surroundings green and fresh. A garden pond pump is used to maintain the water flow and avoid water stagnation. The pumps help in eliminating the pathogens and mosquitos that grow in the stagnated water. These pumps are used for circulating water are called as the garden water pump. Garden ponds are created by the water flow from the rainwater, spring and stream waters or the groundwater. Garden ponds contain a mixture of water from the rainwater, groundwater, stream water, and tap water. The tap water is rich in source of minerals and nutrients. These nutrients may cause the physical and chemical condition of the water to change. The change in water condition affects the growth of the wildlife and aquatic organisms. To maintain the water condition, the water must be circulated in the ponds. Water circulation is done by the garden pond pumps. Water circulation also increases the amount of the dissolved oxygen in the pond and helps for the wildlife habitat. They also help to avoid the pollution caused by the nutrient-rich tap water. Let us consider the various factors and the parameters that affect the selection of garden pond pumps. Flow rate – the amount of the water circulated in the pond in certain time. It is usually advised that the flow rate must be equal to half of the pond capacity. And it is expressed in terms of volume per unit time and measured in Gallons per minute (GPM). Type of pump – we must choose the type of pump for the pond such as the submersible one or the external one. Submersible pumps are cost effective, quiet in operation and suitable for the small ponds. External pumps have large flow capacities and are suitable for the large ponds. 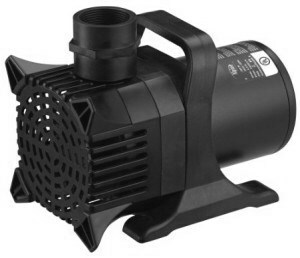 Power – We must choose a pump in the power range that is suitable for the desired conditions. Power is the amount of energy required for circulating the water for the required flow rate in the pond. It is usually measured in terms of Horsepower (HP). Filters – We should have a suitable filtration system in our ponds. Filters help to avoid the unwanted wastes and excessive algae growth in the water pond. Filters must not restrict or lower the flow rate of the water circulation in the pond. Power source – The pump is powered by the power source such as the electrical, solar, etc. We can give electric power through power cords isolated from the contact with water. It is generally advised to use the solar power as they are cost effective and the green source of the power. Other factors – we must also consider factors such as the cost to operate, reliability, pipelines, and plumbing. Our pumps are going to operate non-stop, so we have to choose a reliable pump for the operation. Pump failure may cause the pond to suffocate. Pipelines must be installed in such a way they don’t block or affect the flow of the water. And pipelines must be checked for the leaks and cracks periodically. They are manufactured in the industries such as Laguna Pumps, Aquascape Pumps, Tetra pond Pumps, Alpine Pumps, Life guard Aquatics, etc. Their costs vary from as cheap as 25-50$ for small pumps to costs of 1000$ for high capacity pumps. Laguna Pumps manufacture the electronic controlled pumps with a self-regulating system called the Smart pump technology. It tracks the power consumption, hydraulics, and impeller direction and ensures the efficient functioning of the pump. Alpine Corporation is a leading manufacturer of pumps for the home and garden decorative materials. They give many decorative, creative fountains with more innovative designs of the latest fashion. Aquascape Pumps is a small scale manufacturer of the fountain and pond pumps. They also retail dealers for all the accessories for the pumps. They usually deal with the pumps and accessories for the domestic and household purposes.